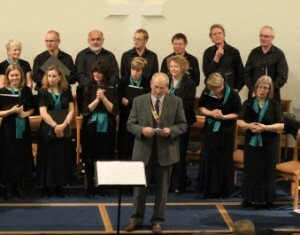 Ashbourne Methodist Church was the venue for a concert to raise funds for the Rotary Club of Ashbourne. Linda Perry Smith conducted a group from the Ashbourne Singers in singing some of their signature pieces – The vicar of Dibley theme, Candle on the water, Hallelujah (Leonard Cohen), Can you feel the love tonight and a medley by Rodgers and Hammerstein. 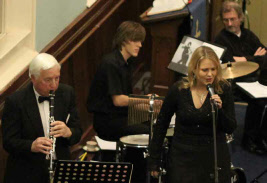 Linda sang jazz alongside Alan Hopkin on the clarinet and Tom Bland on drums – Can’t help lovin’ dat man and I’ve got you under my skin, in the first half, followed by Love is here to stay and All that jazz, in the second half. Mel Gill, Ray Taylor and Don Gwinnett accompanied the singers on the piano, with Sue Tansey singing Stranger in Paradise and Tim Tarling singing If I were a rich man. Ray Taylor and Liz Grime sang True love, accompanied by Anne Pepper and Rob Morton sprayed the front rows with water as he sang Singin’ in the rain, to the delight of the audience.